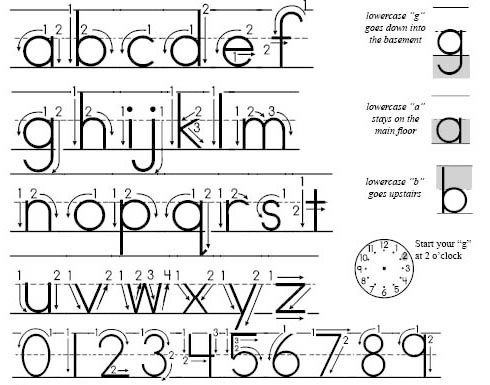 To master making your letters, you will need to practice. We have included a handwriting chart to help you. USE YOUR METRONOME TO DRILL YOUR LETTERS DAILY! When you use the metronome, you will get a rhythm to your writing. When you sound and write to the metronome, you will imbed the letter shape deep into the brain and it will become automatic! What a wonderful brain we have! 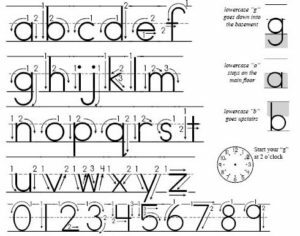 As you learn letters, come back to this page, and practice tracing your letters again and again. Copy or cover this page with plastic and trace right on the page! Be sure to make your letters from left to right at all times. We all know “b’s” and “d’s” are easy to confuse. 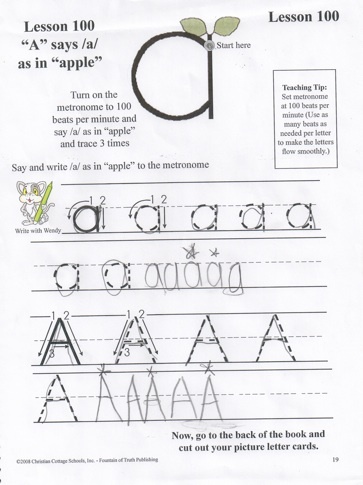 Be sure to make the stick first on the “b” and say /b/ as you write. You will notice the mouth is in a line as you say /b/. As you say /d/ the mouth is open in a circle, so make the circle first on the “d.” Also note that letters have a main floor, an upstairs and a basement. The letter “a” is on the main floor, the letter “b” goes to the upstairs, and the letter “g” goes to the basement. Certain letters start at the 2 o’clock position. Use a clock to show where to start these letters (“c,” “g,” “o,” “q,” and “s” are all 2 o’clock letters). 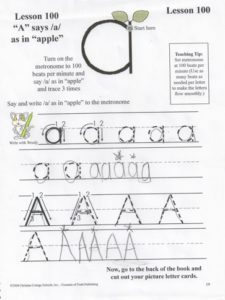 When learning letters, and writing words, put a star on the words and letters with the best handwriting. This encourages the student to try their best, and gives them positive reinforcement.